You guys…I am so excited about this book! The illustrations are so fantastic! If you can’t tell, this is a Bible story. The Bible is full of exciting stories that fill children with awe and wonder. But kids need to know how all those classic stories connect to Scripture’s overarching message about God’s glorious plan to redeem his rebellious people. In this book, Kevin DeYoung – a best-selling author and father of six – leads kids and parents alike on an exciting journey through the Bible, connecting the dots from the garden of Eden to Christ’s death on the cross to the new heaven and new earth. It is told in such a way as to not be overwhelming at all, but kids can understand the whole story! 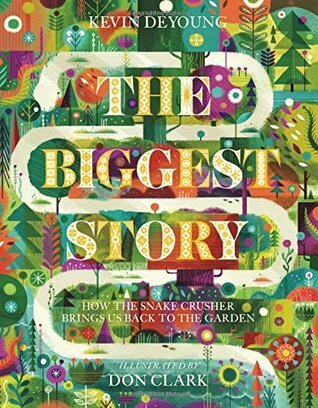 With powerful illustrations by award-winning artist Don Clark, this imaginative retelling of the Bible’s core message – how the Snake Crusher brings us back to the garden – will draw children into the biblical story, teaching them that God’s promises are even bigger and better than we think. Here is an interview with him that includes his thoughts on his illustrations for this book! This book is definitely something to hold on to once you get it! It is told in such a great story like way. It also has a ribbon book mark. It is a hardcover book with 132 pages. Here is a little video to hear a little about the book! You can purchase it at this website or on Amazon. Or…..you can enter for your chance to win a copy down below! 🙂 If you check out that first link you can also see some of the book inside and get more information as well! Hmmm… Maybe Noah’s ark & the flood. This looks so good! Thank you for hosting and good luck to all!